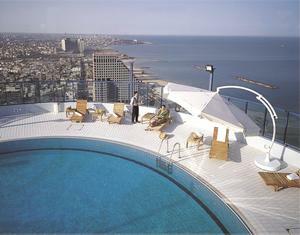 A spacious luxurious suite hotel at the heart of Tel Aviv city overlooking the Mediterranean sea. Isrotel Tower is a Business as well as a pleasure hotel offering one of a kind service and utilities. A prime location for the businessman, close to all the major offices and business center. 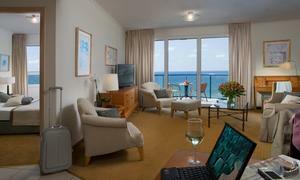 It is also a prime location for tourists, close to all the shopping malls, theaters, cafes, restaurants, beaches and more. 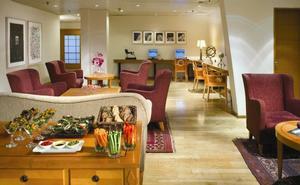 The hotel offers a business lounge which offers a perfect quiet place for meetings. The lounge serves breakfast, light meals, snacks, soft and hot drinks all day long. There are several internet stations – WiFi for additional fee. There is also a conference hall at the disposal of our guests where meetings, conferences and seminars can be held. All suites are luxurious and well furnished and they include T.V, phone, air-conditioning, coffee kit, kitchenette, safe, radio, mini bar, sitting area, stereo CD player, refrigerator and some suites have a lounge area. WiFi is available for additional fee. The Isrotel Tower Hotel Tel Aviv is located on Hayarkon Street right next to the mediterranean sea and the center of Tel Aviv. The hotel is easily accessible by public transportation as well as taxis due to the hotel's prime location, right on the beach.